There are many varieties of rice. But Nigerians love to eat the long grain white rice which is firm in nature. This variety of rice contains a lot of carbohydrates, up to 80 grams per 100 grams of cooked rice. To reduce this high amount of carbohydrates, it is normal practice to parboil the long grain rice again. 'Again' because apparently, the long grain rice we eat already comes parboiled. Parboiling rice involves pre-cooking the rice in water and rinsing it in cold water before the main cooking. This pre-cooking ensures that your Jollof Rice does not burn before it is done, thereby eliminating the cardboard taste associated with undone Jollof Rice. Some people say they don't want to lose all the nutrients in the rice to parboiling but I'll rather get those trace amounts of nutrients elsewhere than end up with burnt, soggy and not-well-cooked rice. I parboil rice in two ways depending on the rice recipe that I'm making. White rice here refers to rice cooked without any additional ingredient. Salt may be added and that's it. White rice is usually a staple eaten with some kind of sauce or stew. To parboil rice for the purpose of preparing white rice, you want to boil it for a short period of time. You get the chance to add more water as you cook white rice because it will not burn. If you prefer to remove more carbohydrates, you may want to pre-cook it for much longer. To parboil the rice, follow these steps. Wash the rice in cold water (optional) and place in a pot. Add some water, about twice the level of the rice. Set on the stove and leave to cook. Note when the water starts boiling and leave to cook for more 5 minutes. Pour the contents of the pot in a sieve. Place the sieve (with the rice) in a bowl of cold water. Rince the rice and change the water if necessary. Leave in the sieve to drain off all the water. The rice is now ready to be cooked again. Jollof rice refers to all types of rice cooked with added ingredients: oil, tomato stew, vegetables, coconut milk etc. This method is applicable to Jollof Rice, Coconut Rice, Mixed Vegetables Jollof Rice, Fried Rice, Rice and Beans, etc. With these kinds of rice recipes, you do not have the leisure of adding more water as you cook the rice. Once the first dose of water dries and you try to add another, the rice will burn and become soggy. For this reason you want to parboil the rice you will use for any jollof rice recipe a bit more. This way, you ensure that after adding the ingredients, the rice will be cooked by the time the level dose of water dries. Add some water, about 4 times the level of the rice. Note when the water starts boiling and leave to cook till the rice is rubbery. One way to check this is to bite into a grain of the rice being parboiled. If the rice is hard to the bite or even makes a sound when you bite, it is not yet OK to rinse it. If you pinch it between your thumb and first finger and it practically melts, then it is over-parboiled. Somewhere between the first description and the second is the point where you want to put the rice down and cool it. Sounds confusing? No … With experience, you will be more confident in determining the best time. You can also watch the video below to see how it is done. 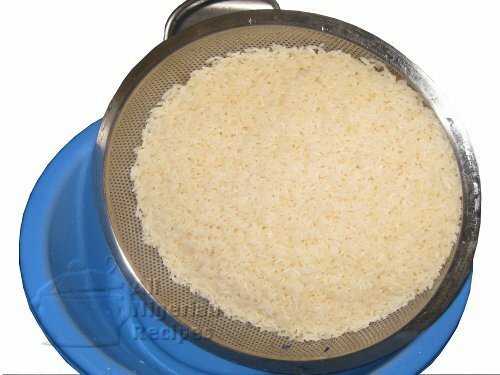 Cool down the rice rapidly by dipping the sieve in cold water, changing water often till the rice is cold.